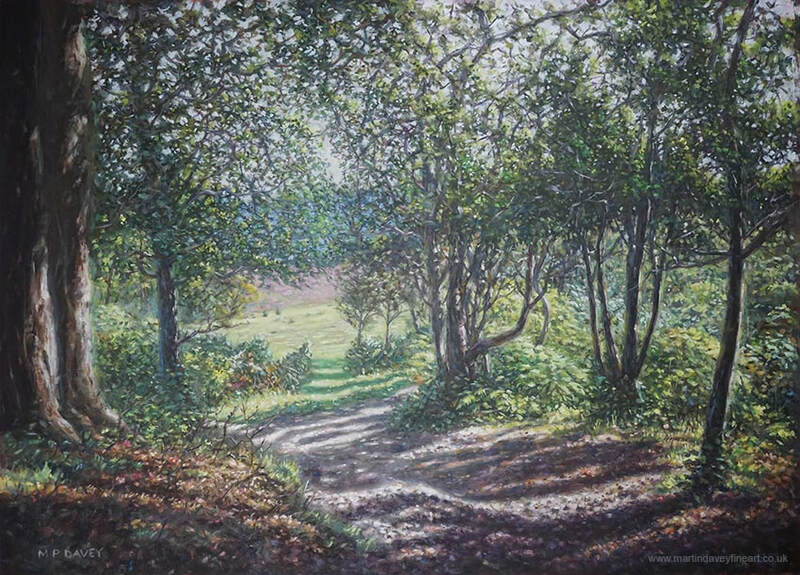 This scene of a path within the New Forest, Hampshire was painted during June 2018. It is sized at 20” x 28” and painted in oils on primed mounting board. In the composition a well trodden path of gravel and soil can be seen winding its way through woodland in to a an opening of bracken and heather in the distance, during a summer evening. Strong, long shadows are cast over elements in the scene. New Forest is a national park in southern England, created during c1000 AD, and is 566 km2 in size. One of the notable features of the forest is the large amount of cows and horses that freely roam around the area. The park is in the county of Hampshire, resting between Bournemouth and Southampton.